Ganondorf Dragmire- "The King of Evil"
Appearance: Ganondorf Dragmire is a sinister, vile looking individual! Just as his own personality & character, his own clothing speaks for itself & clearly gives a good description of the man overall. He is an extremely tall individual & very physically fit. His own size grants him a much more intimidating appearance. Possessing a large amount of physical capabilities, Ganondorf is strong & powerful! But despite his size & mass, he can prove to be surprisingly fast & agile. Unlike most people, Ganondorf is not colored white, tan or black, like most races. Instead, Ganondorf is tinted with a charcoal-like grey in color. Where's the rest of his race, the Gerudo, are tan-like brown. This could be a result of his lifestyle, or other unknown reasons. He bares perhaps one of the most exotic of hair styles, as his hair itself is colored with ginger, & a slight orange-red. His hair is considerable long, however, he has brought his hair all rolled together in an exotic head ornament. Perhaps to give a "Kingly" appearance, baring resemblance to a crown. The head ornament also carries a single jewel that rests upon his forehead. This single head ornament & headwear is possibly a valued treasure from the Gerudo race, in which he wears to possibly signify his hierarchy as the leader of the race. As for clothing, Ganondorf is equipped with many layers & pieces in black, thick & intimidating armor! From his shoulders to his feet, he is heavily armored a very intriguing design of gothic, medieval, Hyrulian armor. Behind him rests an enormous & imposing cape, which gives the evil man an even more wicked & threatening appearance. Other physical features include a full red-orange beard & side-burns. His eyes are colored with a wicked, cold yellow & his right hand is tattooed with a very peculiar image- A mark in the form of three triangles with one highlighted at the top. A mark such as this is believed to the mark of one of the "Chosen Ones." Individuals in which hold what is known to his race & in Hyrule as the "Triforce of Power".He is often seen carrying his favored weapon of his choice & his prized possession- A large broad sword, in which he always takes pleasure of using against his enemies & for combat purposes. Personality: Just as his appearance gives a good description of him for itself, Ganondorf's own personality can describe this wicked man in full detail! He is certainly a man you NEVER want to meet! It is undoubtedly clear that he is perhaps one of the most wicked men ever to live! He is cold blooded, insane, maniacal, twisted, & truly evil at heart! A true tyrant! He is a very hateful & vengeful individual with an unquenchable thirst for power! As many of his actions are driven by his mad thirst for more & more power! This sinister nature has also given him a deceiving nature like a vile snake & a manipulative nature. If he is ever forced to ally himself with other allies, then he will do so with a means to only benefit himself in the end & is able to manipulate others to do his bidding. A true Puppet Master. Ganondorf has also shown to have a monstrous ego. He has an extremely arrogant nature, believing that he is the most powerful & the strongest. Believing that only he is fit to rule over the land with his power. He believes that no one is capable of challenging him However, despite these traits, Ganondorf is, undoubtedly, an extreme intellectual. He is calculative & often constructs many devious plans with brilliant strategy. This has been unmistakably shown during his JFC fights & other forms of combat. & to top it all, he is an individually who is certainly not afraid to show off his power & display his superiority. He's a man who takes enjoyment & pleasure from his opponent's lose, their failure & their suffering! Biography: Much is unknown of Ganondorf Dragmire's history & past to many people. His day of birth is unknown to anyone & therefore his own age. He was born in an age old region of Europe occupied for centuries. A land in which is known today as Hyrule. It is a vast, peaceful land with many different regions & territories. Ruled by the royal family of Hyrule. Ganondorf was born in the region which is closest to the Arabian territories known as the Gerudo Desert. He was born in the tribe & race called "The Gerudo", a race similar to Arabians & have lived mostly in the deserts for countless years. For many of those years, the tribe has only consisted with women. Who have trained themselves as skilled swordsmen, shamans, gypsies & thieves. However, as their legends told, a single man would be born to the tribe once every few years & thus would be crowned the leader of the tribe. That very man, was Ganondorf Dragmire himself. Born as the only man in the tribe, Ganondorf was eventually entitled as the Leader of the tribe & the guardian of the desert. It was also claimed by the tribe's elders that he was to be selected as one of the three "Chosen ones" of Hyrulian legend. A selected individual of two others in which, according to legends, would be bestowed upon by the power of their gods & thus be gifted with a fraction of what is known as "The Triforce." Another went to the princess of Hyrule, while another went to a boy in a far off village. But he would not know this until he would grow older. Through the course of time, it would yet be determined which part of the "Triforce" Ganondorf would be acquired with. But throughout the years, the boy would begin growing up to be very dark & sinister. To become the wicked man he is today, & his people could see it as well. The thirst for power had begun to corrupt his mind. He became the leader of a band of thieves & ruthless war mongers who would invade villages to plunger & conquer. His mad, evil & cold-blooded nature turned him into a ruthless, cunning & sinister man who believed he was unchallengeable. His conquest soon gained him many riches & valuables in which he took to his possession. But it also made him some enemies. Through the course of his life, Ganondorf ruled over the Gerudo Valley & Desert for many years. Even at a young age. He proved himself amongst the tribe was a powerful warrior by practicing swordsmanship & armed, un-armed combat. But even with all the power he had in his disposal, he was still not satisfied. He soon began to turn his attention to the far off kingdom of Hyrule, which was ruled by the royal family. He began to grow a slight form of jealously over the land. In Hyrule, the land was pure & green with peace. But the land of the Gerudo valley was always dry & harsh. With extreme heat & conditions every day. The man began to grow bitter & jealous & thus, he began to form the plan to plunge & conquer Hyrule! He soon lead a squadron & force to invade the kingdom. But to his dismay, he was blind. He was utterly surprised by a miserable defeat. For his crimes across the lands & for invading the kingdom, he was trialed & sentenced to death. Chained & subdued, Ganondorf was to be executed by the group of men known as "The 7 Sages." A group of men who helped sustain & maintain order in the land. But by some divine prank, Ganondorf's desire for power & his hatred truly began to show in his eyes & flow through his veins! He had broken through his chains before his execution & thus beheaded one of the Sages with their very own sword. A broad sword in which he still treasures & carries to this day. With his escape, Ganondorf fled the Kingdom to return once more to the Geerudo Valley where he remained out of sight. But only to return years later with a larger army & force. He had become more powerful then before & thus led the conquest of the kingdom of Hyrule! The kingom was purged, & in ruins from Ganondorf's dark forces! The royal family however suffered through the most! The King had been executed just as Ganondorf himself had nearly been. However, the princess, the last survivor of the family, fled the castle & the Kingdom under the tyrant's gaze. To hide & to stay as far away from the kingdom & as far away from Ganondorf's gaze. With the throne of Hyrule taken & the royal family believed to have been wiped out, Ganondorf soon plunged the kingdom into darkess & a new order had risen. Though many have resisted his rule, none have been able to stand against him for long. He had finally claimed dominion over the land of Hyrule, in which he believed was destined to do- to Conquer. By now, as the elders mentioned long ago, it was clear which fraction of the legendary "Triforce" Ganondorf had now come to acquire & possess. For his great evil, his hatred, greed & lust for power, Ganondorf Dragmire was bestowed....With the Triforce of Power. 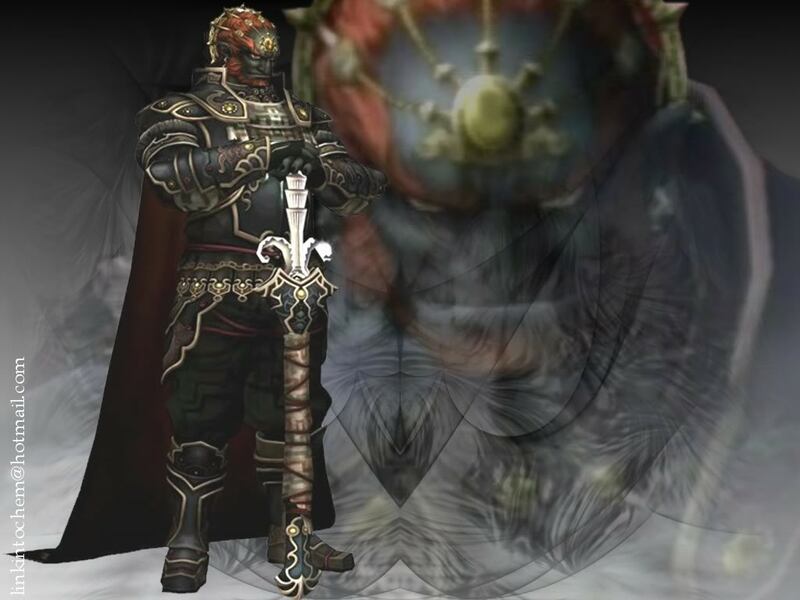 Ganondorf had now become the Great & Tyrannical King of Evil. Ever since, much has been kept in mystery as to the Evil King's whereabouts & his motifs. But it has recently come to his attention that in order to successfully take over the land, then he must first acquire the other individuals who have been entitled as the Chosen ones, much like himself. With them disposed, he will be able to rule all the land with none to defy his rule. However, it has recently come to his attention that there is still a rebellion against his rule.....& the royal family still lives, with the princess who had escaped several years ago! His determination to find this princess has grown stronger & stronger over the years. But to his dismay, he has been unsuccessful. But something had begun to catch his attention- Dinosaurs. The possibilities seemed endless as the Dinosaur-Renaissance rose! The production of living, breathing dinosaurs soon came to his attention & he soon sought to acquire his very own. He has since trained a league of vicious, cold-blooded fighting machines under his guidance & for the famous JFC, which he now simply see's as a mere pass time activity for his own sinister entertainment. In his career & many years of experience, he has become a legend in the community! But a legend that is to be wary of & feared! As the cold blooded tyrant always enjoys more violent fights! Especially from his own dinosaurs. He believes that no amount of training is necessary for his dinosaurs, as their own ruthlessness & violent nature is more then enough to sustain them during battle.